I would like to solve who's P-51 "case 14," if I may............ 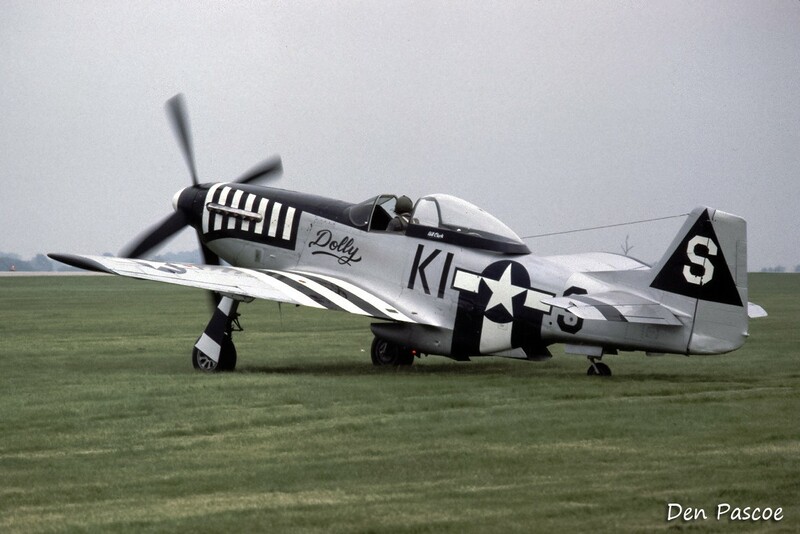 Your picture shows the late Bill Clark's P-51D-30-NT, N51WB, "Dolly." The serial for this a/c has been quoted as 44-74690 (but this is questionable, it has also been quoted as 44-11153, as well as 45-11559! ), and it had served in the El Salvadorian Air Force. In El Salvadorian service, it carried the serial FAS 409, and upon return to the U.S., it was initially registered as NL34FF. Previous to it going to El Salvador, it wore the U.S. civil registrations N5469V, and N6451D. In March 1998, while en-rout to the Valiant Air Command air show in Florida, Clark was killed in N51WB after he failed to emerge from clouds following take off. His friend, Bob Byrne flying "Rascal" (44-74774) took off with him, but emerged from the clouds alone. After this photo was taken, Clark had "Dolly" rebuilt by LyCon Aviation, here in Michigan, and emerged in a new paint scheme representing, but not completely matching, the mount of 339th Fighter Group ace Colonel Bill Clark (no relation). Colonel Clark's World War Two aircraft was called "Happy IV," but the restoration continued to carry the name "Dolly." Case # 14 in this picture is not "Dolly" Dolly did not have the nose stripes and had the name dolly printed in large script where the nose stripes are in this picture. Bill Clark's P-51 did carry the nose stripes and the name "Dolly" at some point. Photos in the survivors section under 45-11559. This photo is dated 1978. Found this interesting. My Dads plane Iwo Jima 45 was called "Dolly" named after my then 4 month old sister who looked like a little doll. Capt JJ Grant, #607, flew missions to Japan and back at the end of the war. Planes of Fame Air Museum at Chino, CA has her flying. I have a picture of Dolly in flight, left wing dipped, that I took at an air show in Geneseo, NY circa 1985. At that time she had Invasion Stripes on nose, wings, and fuselage under the insignia. K I in front of insignia and S behind. On the tail is a black triangle with a white rectangle in it and a red 3 in the triangle. Dolly in script and underlined is centered under the leading edge of the cockpit. At the time I took the picture, the pilot startled the crap out of the whole show. He made a pass down the grass runway and stayed low and went out of sight, circled way out of sight and suddenly popped over willow trees at the end of the runway about 400 feet away. He had the "hammer down". I've never seen a plane go so close and as fast as that.